Posted July 31, 2018 by Amy Kawa & filed under Uncategorized. Three St. Mary’s High School students will be spending their summer learning about surgical robotics. 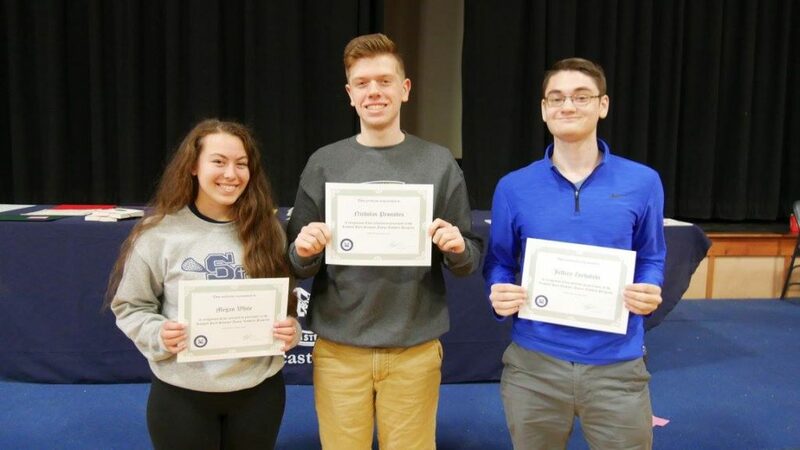 Junior Jeffrey Zoyhofski and seniors Nicholas Pronobis and Megan White have been selected to participate in the Junior Robotic Surgery Challenge (JRSC) at Roswell Park Cancer Institute of Buffalo. Zoyhofski, White, and Pronobis were selected from a highly competitive field of candidates, between the ages of 16-19 and from across the country, in order to participate in the program. For the St. Mary’s group, the decision to apply to Roswell stemmed from a collective desire to learn more about the field of medicine at an early age: “I am fascinated by the medical field as a whole, but wanted the opportunity to be exposed to different fields before I decide on a college major,” said Zoyhofsi. Through the JRSC, students will be exposed to the Fundamental Skills of Robotic Surgery curriculum- also known as the primary method used to train robot-assisted surgeons at Roswell Park. In addition to this exposure, students will have access to workshops and job fairs to really get a feel for the opportunities that await them in the fields of science, technology, and medicine. At the end of the course, students will receive a certificate of completion in Introduction to Robotic Surgery.